Hereditary Cerebral Hemorrhage with Amyloidosis-Dutch type (HCHWA-D) is an autosomal dominant hereditary disease caused by a point mutation in exon 17 of the APP gene. We generated human induced pluripotent stem cells (hiPSCs) from a symptomatic HCHWA-D patient by using non-integrating Sendai virus (SeV). 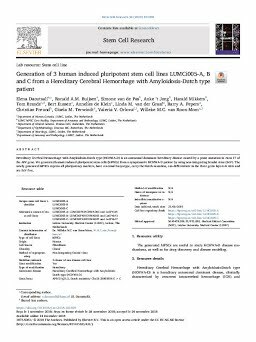 The newly generated hiPSCs express all pluripotency markers, have a normal karyotype, carry the Dutch mutation, can differentiate in the three germ layers in vitro and are SeV free.